I had been eyeballing these Sustainable Sourcing gift box sets of that showed up at Wegmans around the holidays. 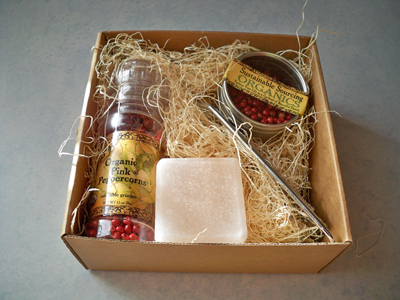 The sets of Pink Peppercorns and pink HimalaSalt Zen Cubes are pretty pricey, but they finally went on clearance. Really, it was the HimalaSalt Zen Cube I was most interested in. I love salt! It's like a mini salt lick! 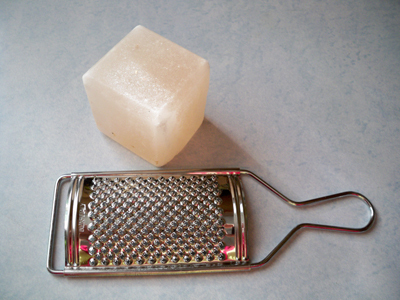 You use the grater to create a super fine powder like powdered sugar. They suggest adding it to edamame, salads, watermelon and even sweets like ice cream and chocolate ganache! I'm a firm believer in using high quality salt for cooking and baking. Himalayan and grey salt are some of the best out there. That and a touch of high quality extra virgin olive oil will make your food taste amazing. Just remember a little bit goes a long way! If you buy gray salt, you may have to dry it in the oven for a couple hours before using. It's a big change from Kosher or regular table salt...you may never go back! Oh I have been watching these at our store. May they be on clearance when I return. Enjoy!! Jenny, which Wegmans did you find them in? I was in Pittsford today and didn't see them. nancy - they were at East Ave Wegs last week in a shopping cart by the flowers with other clearance items. That looks incredible gorgeous! I've never seen something like this in Singapore.